You want to make sure you are prepared for college right from move in day. You want to start out strong, and that means having dorm essentials that make your college dorm room feel like a home away from home. However, it also means making sure you have basic college supplies such as a dorm backpack. To start college out right, make sure you have our Greek Key Turquoise College Backpack in your college dorm essentials. 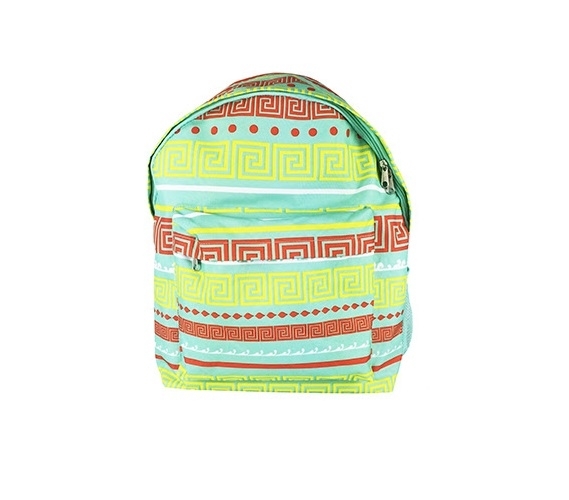 Our Greek Key Turquoise College Backpack has a multi-colored intricate design with turquoise highlights that will add some extra style to your outfit in the morning. When you're studying with friends in the dorm common room or in a coffee shop, you can't carry all of your study accessories in your arms. Nor would you want to. Carrying your dorm accessories for studying can easily result in you dropping all of those dorm accessories on the ground. With this dorm necessities item, you're getting a spacious main compartment that is perfect for your notebook and tablet or ereader and a front compartment for all that you need to study - smartphone, calculator, highlighters, and more.